How can I get my drive-thru equipment to you for repair? 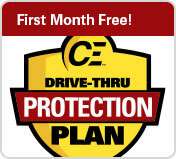 How do CE’s drive-thru equipment maintenance agreements work? What kind of warranty does CE include with its drive-thru repairs, accessories, and systems? How do CE’s battery special work? I can’t find pricing for a certain product on CE’s website. Where can I find help? What is CE’s returns policy? Does CE provide installation and other field services? Why would I buy a new versus refurbished drive-thru headset system? Does CE stock all models of refurbished drive-thru equipment? What is the value of my existing drive-thru system as a trade-in? What is “Narrowbanding” and how does it affect my drive-thru equipment? Easy! Place your broken drive-thru equipment in a box, print a free UPS label and drop it at any authorized UPS service location (or give it to your UPS driver). We’ll pay for the inbound shipping, repair your equipment, send it back to you, and follow up with an invoice. If you don’t have access to a printer, just call us at 877-731-0334 and we’ll mail you some shipping labels today. Our drive-thru equipment maintenance agreements (EMAs) give you the comfort of fixed, low, monthly payments…no surprise repair costs regardless of your repair demands. CE offers EMAs for one to one thousand stores, with any mix of headset and timer brands. We will develop the details – contract duration, shipping options, advance exchange options – to suit your exact needs. Call us and we’ll do the rest! CE’s new products carry up to a 1- year warranty and new HME and Panasonic equipment are covered under these manufacturers’ product warranties which range up to 2 years. 3M equipment sold by CE does not come with a 3M manufacturer’s warranty, however, CE does provide a CE warranty on all 3M equipment sold by CE. CE stocks essentially 100% of our products and accessories, and any orders for those items received by 3pm (CST) will ship on the same day. We are also lightning fast with repairs: 24-hour Drive-Thru Repair turnaround (from the time we receive your equipment), and we will ship it overnight upon your request. If you have a pending order, just call us at 877-731-0334 to get the exact status of (and tracking information for) your order. CE offers our own brand of drive-thru accessories including drive-thru batteries for any wireless drive-thru systems. These batteries offer a high quality alternative while providing great savings, especially if you take advantage of our drive-thru battery special. 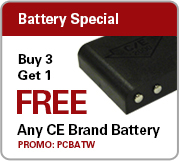 Just order 3 of our batteries and we’ll give you a 4th battery for free! Online or by phone, your choice. In our quest to make our website and catalog user friendly, we have opted not to show every option for every drive-thru system, part or accessory. We have many items that are not shown on the website or catalog, and, if we don’t have what you need, we can get it for you. Just call us at 877-731-0334! CE will accept any undamaged drive-thru equipment if returned within 30 days of its purchase, and will apply the purchase price as a credit to your account. However, a 20% restocking fee may apply, so please give us a call if you are unsure of your needs at the time of your order and we will be happy to help ensure you are getting the right items. Please call us 877-731-0334 for an RMA number to ensure proper credit of all returns. CE provides installation and field services only in the greater St. Louis, Missouri area. We are also happy to help address many of your drive-thru repair needs remotely by phone, through our technical support department. If on-site service is needed outside of St. Louis, then CE will gladly refer you to one of our large network of drive-thru repair service & installation providers nationwide. That depends! CE is uniquely qualified and authorized to sell new HME and Panasonic drive-thru headset systems, as well as countless refurbished systems of any brand. Call us at 877-731-0334 to discuss your priorities – initial costs, operating costs, technology needs, brand preference, warranty, etc. – and we will help fit you with the perfect drive-thru system to suit your needs. CE maintains stock of most every brand and model of drive-thru equipment that we repair. In those rare cases that we are out of a refurbished item that you need, we will put your name on our waiting list and call you as soon as we stock up on the requested item. CE refurbishes most models of legacy drive-thru equipment, so most any equipment that you have – regardless of age or condition – has some value. That value obviously depends upon many factors, so we would ask that you call us for a fast quote on your trade-in value. The FCC put new rules into effect on January 1, 2013, designed to free up air waves in the 150-512 MHz frequency range. RF drive-thru equipment operating in this frequency range and at an efficiency of more than 12.5 KHz (the “narrow band”) is hereby illegal to operate. Several Panasonic drive-thru headset systems fall into this group of non-compliant products. CE has many options to minimize your cost of compliance with this guideline. See www.fcc.gov/narrowbanding for details, and call us at 877-731-0334 to discuss your drive-thru equipment options.